A sinister addiction has been ripping it’s way through North America since the early 1990’s and it’s getting worse every year. Dubbed the ‘Opioid Epidemic’ by the mainstream media, overdoses from opioid drugs have claimed over 64,000 lives in 2016 alone. That’s 64,000 siblings, children, parents and loved ones. For comparison, overdoses accounted for at least 16,000 deaths in 2010 and over 4,000 in 1999; the seriousness of this tragedy cannot be overstated. While this is a very complicated issue with many different facets, what is known is that during the 1990’s the pharmaceutical companies claimed that prescription opioid pain relievers were not addictive and encouraged doctors to prescribe these medications for pain relief. Like cigarette companies in the 1930’s who claimed smoking was actually good for your health; these pharmaceutical companies were dead wrong. And just like the cigarette companies - being wrong hasn’t stopped them from profiting immensely from this escalating crisis. The truth is, these drugs are highly addictive because of the euphoric high they provide. Over time, a user has to take more and more to achieve the same effects and in the process their brain becomes physically dependent on the substance. Once they become addicted and are unable to get enough from their doctors and pharmacies many turn to street drugs like heroin - OR - Increase their dosage and die from accidental respiratory failure. The sad unfortunate truth about the situation is that society looks at these individuals as criminals instead of the victims that they are. Addiction is a disease of the brain and we need to start looking at it for what it is - If we have any hope of fixing this problem before losing countless more loved ones, countless additional members of our communities will struggle in silence. You can be addicted to more than just drugs or a bottle of alcohol, so please stop shaming those who are afflicted by it. If you or someone you know is affected by any type of addiction, please encourage them to get help. We need to stop judging each other so harshly because that’s exactly what keeps so many from reaching out for the help they desperately need. The Substance Abuse and Mental Health Services Administration has a free, confidential hotline that can be called at any time at 1-800-662-4357. You can also visit their official website to find nearby treatment services. This song is about the struggles of various prescribed addiction’s and the disgusting profits pharmaceutical companies have made on the backs of the poor and vulnerable. Furthermore, it’s about how pill-happy the medical industry has become. We all want a quick fix now to our ailments, our depression, our weight problems, our chronic pain and pharmaceutical companies are more than happy to give it to us for a price. These issues stem from the very base of our society’s foundation and there is a deeper problem lurking underneath this opioid crisis. Our institutions are fundamentally broken and we’re not sure that anything short of a revolution is going to save us. Medication can’t fix everything and it certainly can’t fix how isolated we’re becoming as a society. We believe that coming together as a community to support each other is what will overcome this growing feeling of isolation. We are social creatures after all and whether we want to admit it or not; we crave connection. It may sound idealistic, but if everyone had a community that loved and cared for them, and they truly felt that love; they wouldn’t have a reason to turn to these addictions in the first place. It baffles us that substances like alcohol and cigarettes which claim millions of lives every year are treated as “recreational fun”… yet cannabis, a plant that has resulted in exactly 0 fatalities EVER and has been proven to provide positive medical benefits, is treated as a schedule 1 drug by the DEA. Now that the establishment is finding profits in the marijuana industry, it’s only a matter of time before this is changed, which is encouraging, but it will never change how many people, especially people of color, that have been locked behind bars over a plant. This fundamental hypocrisy is what “Prescription Addiction” is about. We’re all very proud to finally be able to release this song and we sincerely hope you enjoy it. Prescription Addiction is now available on itunes, spotify, amazon, youtube, and all other major music streaming services! So why try at all when you already know you’ve lost? Tell your friends about our new EP record! Share on Twitter, Facebook and Instagram! When will the album come out? We have not announced a release date as of yet but we will post updates as we fulfill each step in the mastering and distribution processing stages. Just prior to release of the album (see above). Digital copies (or codes for the download) of the album will be e-mailed to everyone at least 24 hours prior to official release. I placed an order and have a question. 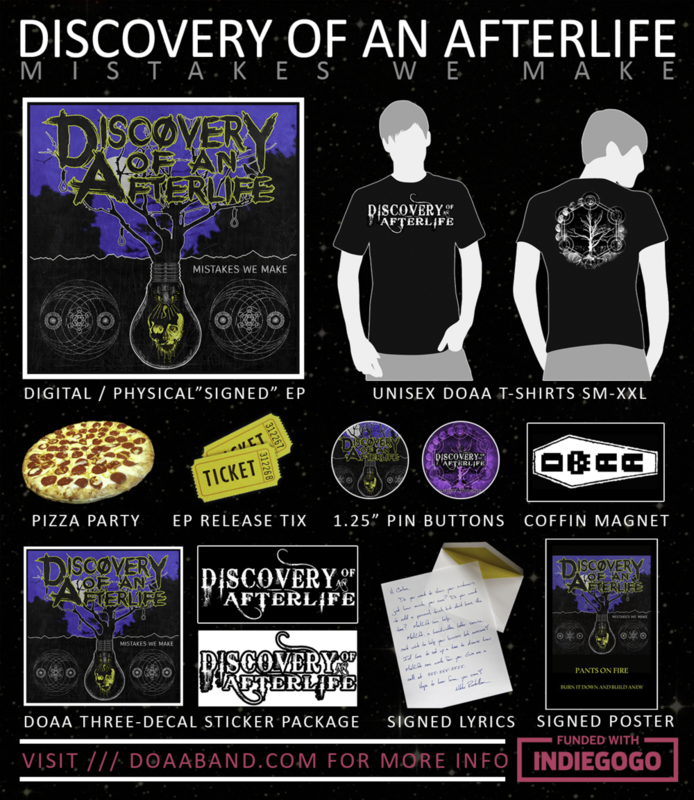 If you have placed an order please send an email to discoveryofanafterlife@gmail.com and we'll do our best to respond ASAP. --- Likewise, if you haven't placed an order yet and would like a question answered, please send an email to the same e-mail listed prior. Thank you so much and we love you!! !